Home › ModernTribe's Blog: Modern Jewish Life & Style › We came, we saw, we ate! We came, we saw, we ate! 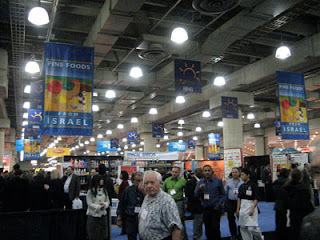 Today we headed over to Kosherfest at the Javitz Center in NYC, where kosher food companies "exhibit" their products. Kedem, Manischewitz, Streitz's, you name it, they were all there. nosh section, and although we did not find anything new for the site, we did fill up quite a bit. It was such a huge show, and naturally, we wanted to try everything. We were very tactful, and careful to take kashrus into consideration. WE first hit all the dairy booths, waited the customary time period, and then hit the meat booths. Needless to say, we were stuffed! FYI - if you're interested in learning more about keeping Kosher, we just got in this terrific book at Pop Judaica called Kosher for the Clueless but Curious. 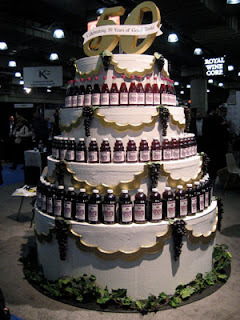 Kedem Grape juice celebrated their 50th anniversary with a giant cake of grape juice. 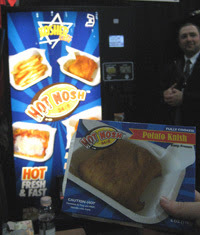 The new kosher vending machines. Coming to a Yeshiva and sports stadium near you. 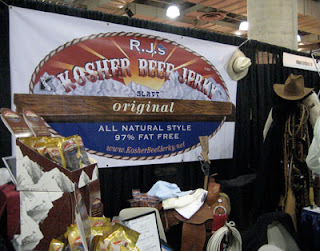 Kosher Beef Jerky. What will they think of next?